When Dr Zhang Qiang, a vascular specialist in a public hospital in Shanghai, quit to join the private sector, news of his departure reverberated through the healthcare sector. His reasons - including better pay, higher patient care and deeper professional pride - resonated with other doctors trapped in a state system where reforms are slow, respect rare and responsibilities restricted. "I am chasing my dream of being a really good doctor in China," Zhang said. His microblog was reposted more than 2,000 times after he announced his job change there, with most comments from colleagues and other healthcare professionals. 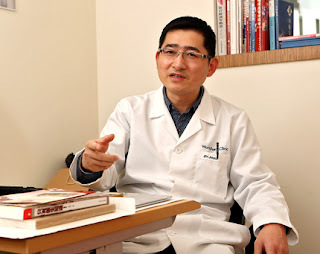 "Shanghai WorldPath Clinic International offers a good platform for my professional development and views both doctors and patients as its clients," said Zhang, who gave up an annual income of 400,000 yuan (US$63,492) to go to the private sector, where salaries are determined by services rendered. He said his new employer has a rule that gives doctors about half of surgery and health service fees paid by patients. "The payment system may reflect the doctor's expertise but it also provides an incentive for quality care for patients," he said. "The income from my first month here will probably be about the same as what I earned at Shanghai East. I am still familiarizing myself with this new system." The state-owned healthcare system in China is in dire need of reform, he said, and he hopes publicity about his job will underscore that point. International hospitals and clinics, financed by overseas investors and staffed by both local and foreign professionals, have a growing presence in the local health market. So far, Shanghai has some 20 joint-venture medical facilities and another 10 international hospitals and clinics are expected to open in the next five years. So-called "international medical facilities" charge more for a higher and more personal level of care than at overcrowded state hospitals. The government has been encouraging the establishment of more of these facilities to meet a growing demand from people who can afford it and to serve as an example for lifting the standards at state-owned institutions. "It is not easy to leave state-owned hospitals, especially for a senior doctor like me," Zhang said. "I got through the most difficult period and started to enjoy a high professional position and income, compared with younger doctors. But I wanted more. I wanted work that was at the forefront of healthcare services." At WorldPath, he said, his only job will be the care and treatment of patients. It's what he calls being a "pure doctor." "I am not kidding," he said. "We are not 'pure doctors' in state-owned hospitals, where evaluations are based on how many articles we get published in the Science Citation Index, not on patient satisfaction and the quality of surgical work." The "publish or perish" evaluations for promotions and pay can be riddled with corruption and cheating, he said. Zhang said the current state system ties doctors to their primary place of practice. The government technically allows a doctor to practice in two licensed hospitals or clinics, but a doctor can't accept a second job without permission from the primary hospital. That permission isn't usually forthcoming. "If the second place is a private hospital, especially a high-end hospital with a better environment and higher charges, a state-owned hospital will view it as a drain on its medical resources," he said. "It's wrong for hospitals to view doctors as their own assets. Medicine is a free profession in 90 percent of the countries in the world." He said doctors aren't accorded much respect in state-owned hospitals. Some are tempted to accept gratuities from patients or their families and prescribe expensive and unnecessary medicines and tests to supplement their low pay. Zhang's departure has triggered widespread comment from the medical community. Dr Wang Guisong, senior neurosurgeon at state-owned Renji Hospital, said he sympathizes with Zhang. "But not every doctor can survive by leaving the state-owned system, which restricts you but also protects you from the keen competition," Wang said. "However, it is true that the platform of a state-owned hospital is too limited, and doctors with capabilities have to think about their own futures." Dr Shen Guoxiong, who left Shanghai No. 9 People's Hospital and opened his own plastic surgery clinic in 2009, said the transition to the private sector can be wrenching. "Finding a good private hospital that respects the value of doctors is important," he said. "But we have seen some doctors return to state-owned hospitals after finding it hard to adapt to the different cultural background and values of private international hospitals." Zhang said if the Chinese health system isn't reformed, the exodus of highly qualified doctors will continue.